Steak and Blue Cheese go together like humans and oxygen. And why not make it better by combining them with salad? This is something I like to make when I have people over because it’s really easy, flavorful, and can readily be tailored to personal tastes, unlike a lot of meals. It is also filling while still being healthful. This dish is more about the process than the ingredients, so I am not including amounts, but I will outline the items I generally use when making it. But again, it is how I make it rather than what I include that is important, so stay tuned for that. If you can grill the steak ahead of time, that will contribute the best flavor, but broiling works as well. I generally use Italian salad dressing from the packet that you add vinegar, water & oil (olive oil) to. But rather than using red wine vinegar I recommend using balsamic vinegar, which combines exceptionally well with the blue cheese in this salad. 1. Step 1 is where most of the work comes in. I dice up all the vegetables (except lettuce and avocado) into small, bite-sized pieces and place them into bowls as preparation for the mixing. The steak should be cooked to your preference and allowed to sit for a while to reabsorb all its juices. When cool, cut into small pieces, cutting it into strips against the grain, then cutting those strips into smaller, bite-sized pieces. 2. I then cut the lettuce into a chiffonade. 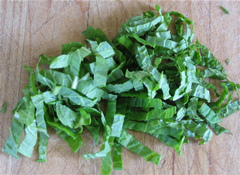 This is when you cut it into small, thin strips (see image). This not only makes the salad easier to eat, but looks really nice when combined with the other ingredients. 3. You then have a choice, you can put everything into bowls and dress, or, my preference is to add the lettuce, carrots, onion, celery, peppers, and cheese into a bowl and add a little less dressing than I think I need (this keeps the calories down and will actually taste just fine). I then mix everything up, which spreads a thin layer of dressing onto everything, then place in serving bowls. 4. 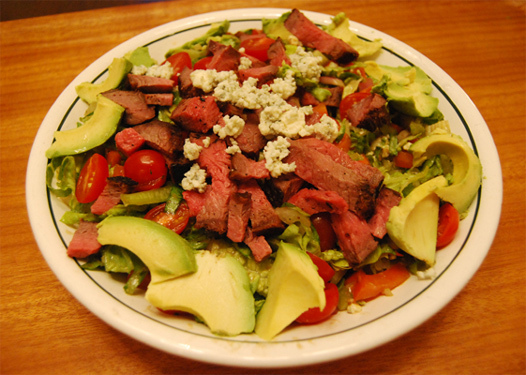 Add the steak and tomatoes to the salad. Then scoop out spoonfuls of avocado onto the salad. 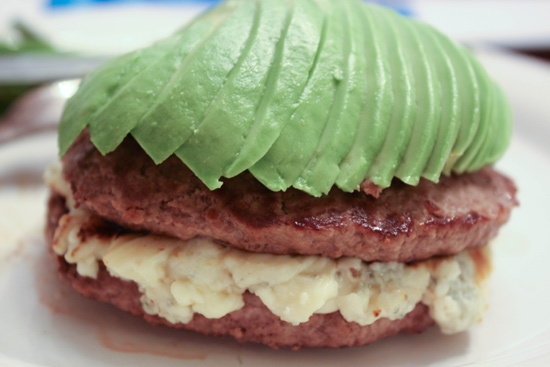 I top it off with a little more blue cheese for presentation purposes and serve. By chopping all the ingredients into small pieces, and coating them well with minimal dressing, you will achieve a healthful salad with a lot of flavor, that doesn’t have to be high in calories. Yes, the blue cheese is not low calorie, but you don’t need a lot of it when you are mixing all the ingredients together, the flavor will carry throughout the salad. This dish always goes over well when I serve it. Some people leave the steak out (my vegetarian brother) and the salad will still taste great.